We all hit stretches of life when multiple deadlines, events, and obligations coalesce at once, creating a particularly frenetic daily pace. I'm there right now. I know I'm going to make it, but I find myself weary with the most basic tasks, like getting into the shower, or getting back out of the shower, or remembering whether I actually washed my hair or whether I just thought I had washed my hair while I'm in the shower, or putting on clothes, or making myself presentable in the morning. On days like this, I seek shortcuts to make even the smallest tasks easier. Take ironing, for instance. When it comes to ironing, I'm admittedly lazy. Thus far in life, my primary two strategies to make ironing easier could be broadly categorized as avoidance: 1) I don't buy many clothes that require ironing, and 2) I try to reach the dryer immediately after the cycle is done so any slightly-wrinkled clothing can be shaken into submission and declared good enough. Maybe you're like me in this regard. Maybe you use your iron to seal kid's crafts with melted beads more frequently than to press button-downs. Maybe you live in knits and jeans and yoga pants. But, despite our best avoidance efforts, what if there's one persistent wrinkle on an otherwise acceptable garment? What if a shirt's collar or a skirt's hem needs a simple touch-up? Well, if you're anything like me, these minor dilemmas provide the perfect time to rethink what we mean by the word iron. On more than one occasion, instead of dragging a cumbersome ironing board from the laundry room, I've headed to the bathroom, heated up my curling iron with the click of one button, and run that iron down the crease. It's that simple. Real ironing? Ain't nobody got time for that. But using your curling iron in a pinch? 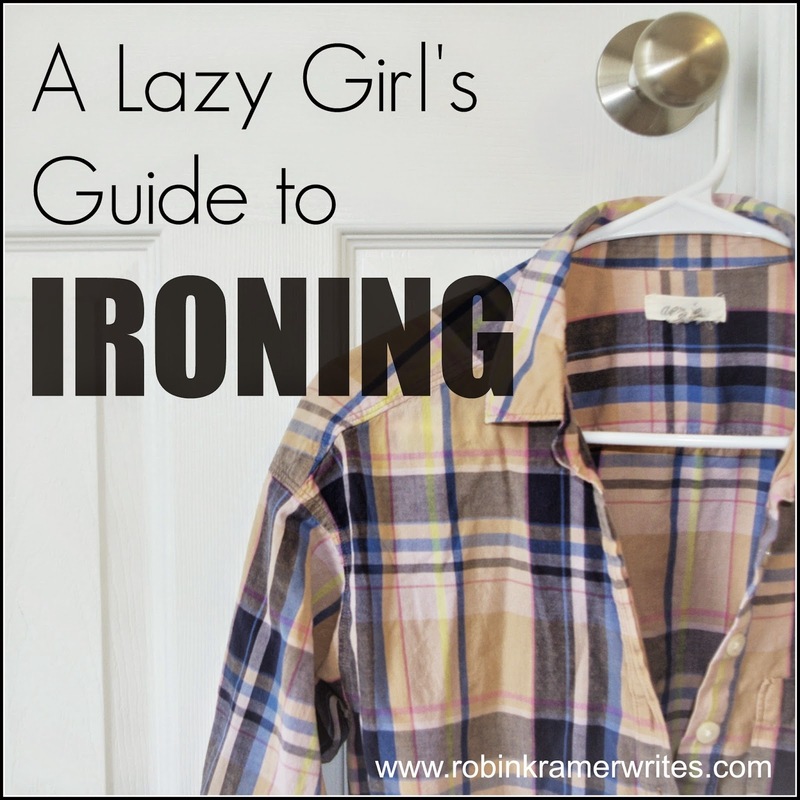 Well, that's a lazy girl's guide to ironing. Love it! Now if I only had a curling iron. Hmmm. I have also used the blow dryer to get wrinkles out! Smart -- thanks for the tip, Maria! Seriously!?! Why have I never thought of this? Genius! I love finding those a-ha obvious solutions, right?! LOL - does it actually work Robin? I usually just plug in the iron (in a huff) and violently iron the wrinkles out, meanwhile splashing all the water from the reservoir on my clothing item because I was too impatient to wait for the darn thing to warm up. Yes. I have anger control issues when it comes to ironing. Okay then... I will take your word for it and give it a shot next time. As long as I don't burn myself, anger management should be A-OK. I am so glad to know others do this! My daughter would just look at me with one eyebrow raised when she would walk in and see me with my shirt in the curling iron. For my son's polo collar, I have also pressed the edge it in a book with weight (other books usually) on top. If I do this before showering, it usually is good enough by the time we have to leave for church. I will have to try the blow dryer tip.